When a peripheral nerve runs through a very narrow area it may become compressed. This can cause chronic pain, numbness, tingling and poor muscle strength. If the compression and inflammation worsen, the area can lose sensation and muscle strength. In severe cases the nerve may die unless compression is relieved. Typical examples of acute trauma are a stretch injury (usually to a limb, shoulder or the neck), a laceration due to a knife or other sharp object, or a missile wound. Whether a tumour is benign or malignant (cancerous), it can cause serious damage to a peripheral nerve. 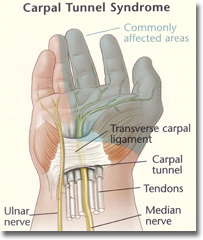 The carpal tunnel is a narrow passage through which the median nerve and nine tendons pass. It occurs when the contents of the tunnel swell, or the ligament forming the roof of the tunnel thickens to compress the median nerve. Common symptoms are tingling, numbness, pain running up the arm and shoulder, pain when gripping and a decrease in hand-motor skills. The objective of surgery is to open the carpal tunnel and relieve the pressure on the median nerve. The complete 'Peripheral Nerve Surgery' pamphlet is available from plastic surgeon Mr Murray Beagley. Plastic Surgery Auckland is an Affiliated Provider to Southern Cross Health Society for carpal tunnel treatment.